Desarrollado en 1938 por Vickers-Armstrong, el tanque fue uno de los mejores de su clase. Un total de 8275 vehículos con varias modificaciones se fabricaron desde 1940 hasta 1944. With its slow speed, relatively high armor values, and good selection of guns, a "Pocket Heavy Tank" might be the best way to describe the Valentine. Its play style is not unlike the AMX 40 though a bit faster and slightly more maneuverable at the cost of slightly worse armor. It is a light tank in name only, and should be played like a heavy, taking damage for your allies with your heavy armor. It has no problems accelerating with the top engine, but the 24km/h speed limit will mean you'll be picking up the rear of the advance. Performance is also quite sluggish going uphill. Turning is relatively fast, even with the stock engine, so you're not completely helpless against light tanks and other "brawlers". Your armor, and the proper positioning, will help you bounce shells from Tier 3 vehicles and many Tier 4s. Both the 6 Pounder Mk V and 75mm are worth trying out to see which suits the player best. However both suffer from low rates of fire, and in either case, you'll find that picking your shots on Tier 5s/6s is essential if you choose to engage them. 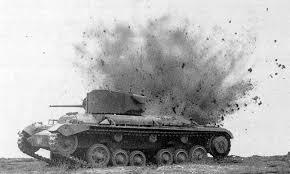 If you find yourself stuck in a tier 6 battle, the best advice would be to follow a larger ally, and allow them to draw fire while you have time to place your shots. The Valentine has a very short profile, giving it the option of going for stealth, if desired. Given its slow speed and the relatively slow firing rate of its guns (apart from the stock gun), passive spotting and sniping are typically the best options when placed in the bottom tier of matches. Naturally this works better with the Camouflage skill, but it's up to the player whether it's worth the trade-off over other skills. Similarly to the Matilda, it can defend positions relatively with its armor, which when sloped can bounce many shots. Only the WS No. 19 Mk. II radio carries over from the Cruiser Mk. II. There's no reason not to install it immediately. You can research the engines first, but if you do, go all the way to the GMC 6004 6-71A. The two in between have nothing to offer, as you can see by the horsepower ratings. You must research the upgraded suspension in order to mount the second turret. Once you have the suspension and turret researched, choose a gun to research. The 6 pdr Gun Mk. V (L/50) is better than the QF 6 pounder Mk. III, but some players may wish to get the latter and use it while working on the former. Once you have one of the available 6 pounders, research the engines, if you haven't already. Valentine started as a proposal based on their experience with the A9, A10 specification cruiser tanks and the A11 (Infantry Tank Mk I). As a private design by Vickers-Armstrongs it did not receive a General Staff "A" designation; it was submitted to the War Office on 10 February 1938. The development team tried to match the lower weight of a cruiser tank - allowing the suspension and transmission parts of the A10 heavy cruiser to be used - with the greater armour of an infantry tank. Working to a specification for a 60mm armour basis (the same as the A.11) but with a 2 pdr gun in a two man turret (the A.11 was armed only with a heavy machine gun), and a lower silhouette and as a light as possible resulted in a very compact vehicle with a cramped interior. Its armour was weaker than the Infantry Tank Mk II "Matilda" but, due to a lower powered engine, the lighter tank had the same top speed. However, by using components already proven on the A9 and A10 the new design was easier to produce and much less expensive. The War Office was initially deterred by the size of the turret since they considered a turret crew of three necessary to free the vehicle commander from direct involvement in operating the gun. Concerned by the situation in Europe, however, it finally approved the design in April 1939 and placed the first order in July for deliveries in May 1940. At the start of the war, Vickers were instructed to give absolute priority to the production of tanks. The vehicle reached trials in May 1940, which coincided with the loss of much of Britain's materiel in France during the evacuation at Dunkirk. The trials were successful and the vehicle was rushed into production as Tank, Infantry, Mark III; no pilot models were required as much of the mechanics had been proven on the A10, and it entered service from July 1941. As well as Vickers, Metropolitan-Cammell Carriage and Wagon - an associate company of Vickers - and Birmingham Railway Carriage and Wagon Company (BRCW) were contracted to produce the Valentine. Metropolitan and the BRCW had both built small numbers of the A.10 and so had previous experience: their production runs were just finishing and they delivered their first Valentines in mid-1940. Production by Vickers peaked at 20 tanks per week, in 1943. Metropolitan used two sites - with Wednesbury joined by their Midland site in production of the Valentine. Vickers output started at 10 per month rising to 45 per month in a year and peaking at 20 per week in 1943 before production was slowed and then production of the Valentine and and vehicles based on the Valentine stopped in 1945. Vickers-Armstrong produced 2,515 vehicles and Metropolitan 2,135, total UK production was 6,855 units manufactured. For developing its own tank forces, Canada had established its own tank production facilities. An order was placed in 1940 with Canadian Pacific and after modifications to the Valentine design, to use local standards and materials the production prototype was finished in 1941. Canadian production was mainly at CPR Angus Shops in Montreal. 1,420 were produced in Canada of which most were sent to the Soviet-Union, alongside 2,394 of British production. They formed the Commonwealth's main export to the Soviet Union under the lend-lease programme. The remaining 30 were retained for training. The use of local GMC 'Detroit' diesel engines in Canadian production, was regarded as a success, and the engine was subsequently adopted for British production. Between the British and Canadian production, at 8,275, the Valentine was the most produced British tank design of the war. Valentine was of conventional layout internally divided into three compartments; from front to back the driver's position, the fighting compartment with the turret and finally the engine and transmission driving the tracks through rear sprockets. The driver's area contained only the driver and the driving controls. The driver sat on the centre of the hull line gaining access through either of two angled hatches over the seat, though there was an emergency exit hatch beneath his seat. The driver had a direct vision port - cut in what was one of the hull's cross members - in front of him and two periscopes in the roof over his head. Driving was by clutch and brake steering through levers whose control rods ran the length of the hull to the transmission at the rear. Behind the driver was a bulkhead that formed another of the hull's crossmembers and separated him from the fighting compartment. The first tanks had only a two man turret - the gunner on the left of the gun and the commander acting also as the loader on the right. When three man turrets were introduced the commander set to the rear of the turret. The turret was made up of a cast front and a cast rear riveted to the side plates which were of rolled steel. All tanks carried the radio in the turret rear. Early tanks used the No. 11 Wireless with tannoy for the crew; later tanks had the No. 19 Wireless which included crew communications with long and short range networks. Turret rotation was by electric motor under the gunner's control with a hand-wheel for manual backup. The restrictions that the two-man turret placed on the commander, made more so if they were a troop commander and responsible for directing the actions of two other tanks besides their own, were addressed by enlarging the turret for the Mark III so that a dedicated loader for the main armament could be carried. The turret ring diameter was not changed so the extra space was found by moving the gun mounting forward in an extended front plate and increasing the bulge in the rear of the turret. This cost a weight increase of half a ton on the 2.5 ton two-man turret. A final bulkhead separated the fighting compartment from the engine compartment. The engine, clutch and gearbox were bolted together to form a single unit. The tank first served in Operation Crusader in the North African desert, when it began to replace the Matilda Tank. Due to a lack of cruiser tanks, it was issued to armoured regiments in the UK from mid-1941. The Valentine was better armed and faster than the Cruiser Mark II. It was extensively used in the North African Campaign, earning a reputation as a reliable and well-protected vehicle. 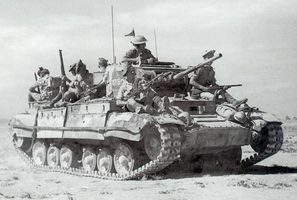 The first tanks in action were with the 8th Royal Tank Regiment in Operation Crusader. Some tanks had managed more than 3,000 miles by the time the British Army reached Tunisia. The Valentine shared the common weakness of the British tanks of the period: its 2-pounder gun lacked high-explosive (anti-personnel) capability, and soon became outdated as an anti-tank weapon too. Introduction of the 6-pdr in British service was delayed until the losses of Dunkirk had been made good so the 2-pdr was retained longer. The small size of the turret and of the turret ring meant mountings for larger guns proved a difficult task. Although versions with the 6-pounder and then with the Ordnance QF 75 mm gun were developed, by the time they were available in significant numbers, better tanks had reached the battlefield. Another weakness was the small crew compartment and the turret for only two men. A larger turret, with a loader position added, was used in some of the 2-pounder versions, but the position had to be removed again in variants with larger guns. Its relatively low height was an advantage in a battlefield with little cover, allowing it to take up a "good hull-down position in any convenient fold in the ground". By 1944, the Valentine had been almost completely replaced in front-line units of the European Theatre by the Churchill (the "Infantry Tank Mark IV") and the US-made Sherman tanks. A few were used for special purposes or as command vehicles for units equipped with Archer. In the Pacific, the tank was employed in limited numbers, at least until May 1945. It was used by the 3rd New Zealand Division in the south-west Pacific campaign. A squadron was required but the 2 pdr HE shell lacked power especially compared to the 18 pound shell of the 3-inch howitzer. So Valentine III's in New Zealand had their main armament replaced by the 3 inch howitzer taken from Australian Matilda IV CS tanks. The converted tanks carried 21 HE and 14 smoke shells. Nine of the new 3-inch armed tanks and 16 normal Valentines - with 2 inch HE shells produced in New Zealand - formed the New Zealand Tank Squadron in 1944. New Zealand retained Valentines until 1955. Around 40 Valentine tanks, and vehicles based on the Valentine chassis, survive. Tanks in running condition are at the Bovington Tank Museum (Mark IX), and in private hands in New Zealand and the United Kingdom. The Bovington collection includes two other Valentines - a Mark II and a Valentine Scissors Bridgelayer. Other examples are displayed at the Imperial War Museum Duxford in the UK; the Royal Military Museum in Brussels, Belgium; the Musée des Blindés, Saumur, France and the Kubinka Tank Museum, Russia. In the United States, the Military Vehicle Technology Foundation and the Virginia Museum of Military Vehicles both own Valentines. Other examples are at the South African National Museum of Military History and the Indian Armoured Corps Museum in Ahmednagar Fort, Ahmednagar. A number of Valentine hulls are in private ownership in Australia. These were sent there after the war for use as agricultural vehicles. Two Canadian-built Valentines survive. Valentine Tank Mk VIIA, no. 838, built May 1943, was a Lend-Lease tank shipped to the Soviet Union. It fell through the ice of a boggy river near Telepino (Telepyne, Ukraine), during a Soviet counter-offensive on January 25, 1944. In 1990 a 74-year old villager helped locate the tank, and it was recovered and offered as a Glasnost-era gift to Canada. It was presented to the Canadian War Museum by independent Ukraine in 1992, and stands on display in the LeBreton Gallery. An additional Valentine built by Canadian Pacific resides at the Base Borden Military Museum in Barrie, Ontario. A notable survivor is the only intact DD Valentine, this has been restored to running condition and is in private ownership in the United Kingdom by John Pearson. A number of DD Valentines that sank during training still lie off the British coast; several have been located and are regularly visited by recreational divers. This includes two in the Moray Firth in Scotland and two that lie 3.5 miles (5.6 km) out of Poole Bay in Dorset. These tanks lie 100 metres apart in 15 metres (49 ft) of water. A further tank is known to lie in around 10 meters of water in Bracklesham Bay, south of Chichester in West Sussex; the hull and turret are clearly recognizable as it sits on a gravel mound. In October 2012, a Valentine Mk IX tank that fell through the ice while crossing a river in western Poland during the Soviet Army's march to Berlin was successfully recovered. 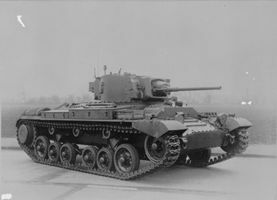 The only surviving Valentine Mk IX to have actually seen combat is reportedly well preserved and could be made operational again within three years.